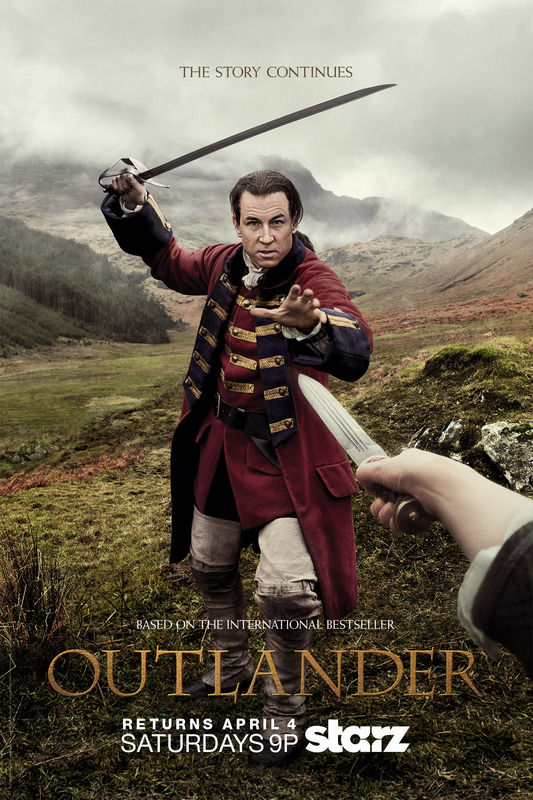 For the final ‘4 Droughtlander’ STARZ reveals new key art for Outlander Season 1B, featuring Claire and Jamie in confrontation with Black Jack Randall. Outlander returns on Saturday, April 4 at 9:00pm ET|PT on STARZ. Happy March Sassenachs! Today, we’re officially one month away from Outlander‘s mid-season premiere, so this means we’ve finally reached the LAST “4 Droughtlander“! 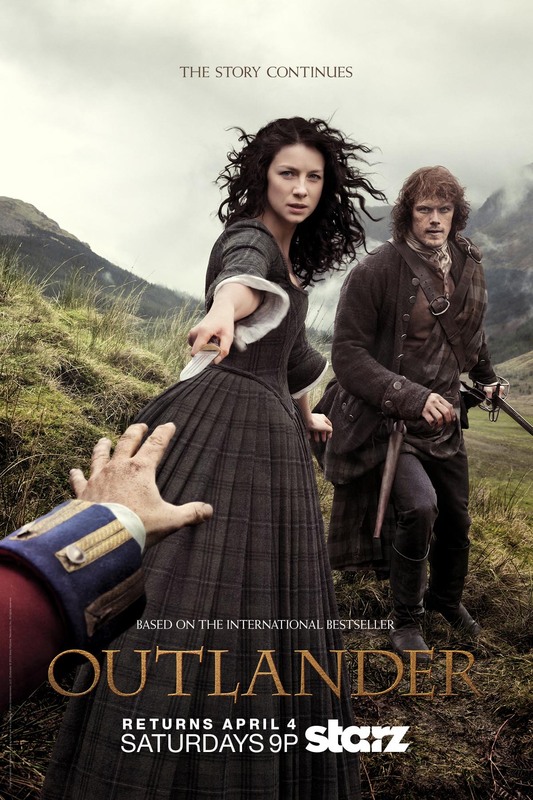 As in previous months, today STARZ gave us another look at the second half of season one. These new images definitely depict the evolution of Outlander‘s story and the confrontation that’s waiting for us in the next part. 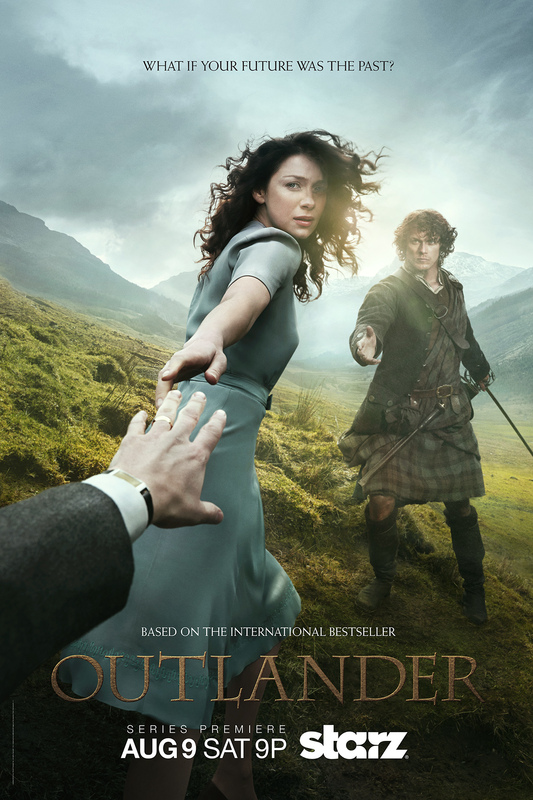 If you’ll recall, the first Outlander poster (which you can see below) features Claire (Caitriona Balfe) with Jamie (Sam Heughan) in the Scottish highlands, and she’s in transition and clearly torn. Her body is mostly facing Jamie (in the past), yet she’s looking at and reaching out to (we presume) Frank in the future. Who does she choose? This is absolutely beautiful imagery and really gives us insight into Claire’s dilemma. Let me tell you, when this gif came across my twitter timeline, I was shocked. First, I love the symmetry between the older poster and the ones we got today—primarily focussing on the setting and body positioning. Yet, so much has changed! This image is firmly in the past: from Claire’s clothing and the hand reaching out, there are NO hints of 20th Century modernity. But look at Claire herself—she’s not at all indecisive! There’s a fierce determination in her eyes and she’s wielding that dagger with authority, united in action with Jamie. And then of course this time, we get to see the other side. It’s not Frank that’s reaching for Claire, but Black Jack Randall (Tobias Menzies), and BJR is intent on doing Claire and Jamie harm. Is it just me or does it look like Claire is actually trying to protect Jamie from BJR??? She has the dagger out, standing in between them, refusing to let BJR get to Jamie. WOW WOW WOW! In the behind-the-scenes interviews we got for February “4 Droughtlander,” both cast and crew alluded several times to the impending darkness of Outlander Season 1B. As far as I’m concerned, these posters thoroughly embody the conflict and adversity that’s ahead. Those of us who have read the books know that Claire and Jamie will face some serious difficulty—the witch trial, Wentworth Prison, among other things. But, for me, the saving grace from all that angst is the strength of their love. Nothing…not time, distance, or even maniacal Black Jack Randall can come between Claire and Jamie. I’m extremely excited about seeing all this unfold over the remaining eight episodes! What do you think of the new posters? What stands out most to you? Share your thoughts in comments! The one-month countdown to Outlander‘s April 4 return is in full effect. I’ll be binge-watching my Outlander: Season 1, Volume 1 DVD/Blu-ray and all the awesome special features. How about you?